Steven Spielberg's “Bridge of Spies” opens with a shot of a man looking in a mirror as he paints a nearly-complete self-portrait. The man is shot from behind. We are not really seeing “him.” We are looking at two reflections, one in glass and one in watercolors. The truth is in the middle. This duality of perception vs. reality and, eventually, the concept of those three triangular points of interest (reflection, man, painting)—which look similar but aren’t quite—will resurface in “Bridge of Spies,” a daring, studied, mannered true story that is at once remarkably genuine and deeply cinematic at the same time. It’s one of the best films of the year. As he has done at least a dozen times before, Spielberg captures the arc of a man who is caught up in something bigger than himself and somehow rises to the occasion. The “Man Under Pressure” this time is Jim Donovan (Tom Hanks), an insurance lawyer called into duty by his government when the aforementioned painter, a man named Rudolph Abel (Mark Rylance), is captured for the crime of espionage against the United States on behalf of the USSR. It is 1957, and the Cold War is a constant concern. Adults still discuss the Rosenbergs around the dinner table while Jim’s children learn about how easily they’ll survive nuclear fallout if they just duck and cover or fill their bathtubs with drinking water. Donovan is asked to serve as Abel’s defense attorney by his boss (Alan Alda), who just wants Donovan to be a warm body—someone to sit next to the traitor to make sure the judicial process runs appropriately. One gets the impression—ably assisted by Hanks’ steely-eyed determination, which recalls the movie icons of cinema's golden age—that Donovan has never just been a cog in a machine. And so he actually tries to mount a defense for Abel, arguing that the seizure of evidence was unconstitutional and making the case that the death penalty would be a politically bad move, even if the public desperately wants to see Abel hanged. Donovan argues that Abel not only represents valuable political currency, which could come in handy if the US ever needs to negotiate with the Russians, but also that Abel should be treated as we would want any American POW to treated in turn. If you think about it, Abel was just doing a job, right? He’s not a traitor to his country. Isn’t it the same job our men are doing around the world? Does that deserve the death penalty? What message would that send regarding the treatment of our captured men around the world? Of course, Donovan is right, and the international picture gets more complicated when a pilot named Francis Gary Powers (Austin Stowell) is captured by the Russians. Despite having no real experience in espionage—which is good because he can’t be seen as a spy, or even a representative of the U.S. Government—Donovan is sent in to mediate the exchange. Once again, Donovan has difficulty doing the bare minimum. In the tradition of the typical Spielberg protagonist, Donovan is a man who doesn’t only do what’s asked of him, he does more. In Spielberg’s vision of the world, this is essential to the image of not only great men, but also to the idea behind the United States—in theory, our leaders don’t simply do what’s necessary, they do what others tell them is impossible. Spielberg’s historical epics have always tended to this examination of overreaching greatness, from Oskar Schindler to Abraham Lincoln. From the very first scene, which is executed with minimal sound design and no score, Spielberg and his technical team work almost like Abel’s painting—focused, deliberate and remarkably quiet. (There’s no score for 27 minutes, until Donovan is followed in the rain, facing his first realization that this spy game is getting dangerous, and Thomas Newman’s effective work is used sparingly from there.) To a degree that might be off-putting for some brought in by the advertisements that make “Bridge of Spies” look like an action film, this is a movie of dialogue and design, more “Tinker Tailor Soldier Spy” than “Skyfall.” It’s a film that builds tension through conversation, as Donovan discovers that the world of espionage is really about deal-making and subterfuge. “We need to have the conversation that our governments can’t,” an important player says. This careful approach easily could have been “sexed up” into more of a traditional spy thriller, but instead Spielberg chose to walk a delicate thematic tightrope—too studied and the film becomes dull; too cinematic and it loses its realism. To say that Spielberg negotiates that tightrope as deftly as Philippe Petit would be an understatement. You could take any scene from “Bridge of Spies” and examine it on two distinct but intertwined levels. First, look at the breathtaking attention to detail—the costume design, the sets—and realize how lived-in it all seems. Even the Donovan home (Amy Ryan plays the concerned wife in a slightly underwritten role) looks remarkably genuine. This film does not fall into the typical period piece trap where it feels more like modern actors playing dress-up than an actual glimpse at history. And yet Spielberg and his team find channels for cinematic vision within that realism. Look at the color palette distinguishing the United States from Germany. When Donovan gets to Europe, everything is washed in blue and gray. Even East Germany has a different color scheme than West, washed out by the ongoing building of the Berlin Wall. Every decision in “Bridge of Spies” feels carefully considered, informing both the realism of the piece and its deeply cinematic purpose. That purpose is embodied in one of the best performances of Tom Hanks’ career. It’s a turn that is easy to take for granted at first. Hanks’ reputation as cinema’s everyman is sometimes too broadly defined. Yes, he rose to fame by finding something inherent in the average man, but he’s also often the smartest and most morally upstanding man in the room. Like Henry Fonda, he isn’t just an everyman—he’s the BEST of the everymen. This role takes that element of the Hanks persona and puts it at the heart of the Cold War and even American foreign policy. Why was America the best country in the world after World War II? Because we had men like Jim Donovan. And yet Hanks doesn’t overplay that heroism, finding the perfect balance between extraordinary and ordinary person. Spielberg and company even give Donovan a coughing, sneezing cold in the final act, highlighting that this flesh-and-blood man is far from 007. Hanks is well supported by an equally-great turn from Rylance. The wonderful actor understands what Abel and Donovan see in each other—they are both men following orders. They are both men who refuse to take the easy way out. And they are both men who can see the bigger picture easier than most, knowing that it is the portrait that subsists, not the real man. It is the image, the record, the interpretation that goes in the history books. At this point, it would be easy to go on to praise Matt Charman and Joel & Ethan Coen’s striking script or examine Janusz Kaminski’s color choices and Michael Kahn’s razor-sharp editing, but we’ve probably already surpassed praise overload. Suffice to say, every technical choice feels like the right one. There are a few moments in the mid-section of the film that feel a bit repetitive—a few too many “will Jim do the right thing?” conversations, when we know damn well he will—but it’s a minor complaint, especially when the film gets to Europe, the pace picks up again, and it never looks back. Since Steven Spielberg began making films in the 1970s, he’s become one of our most essential cinematic historians. He’s often characterized as a director of the fantastic, and films like “Jurassic Park” and “A.I. Artificial Intelligence” certainly bolster this viewpoint, but it is his ability to distill world events into relatable, human stories in films like “Munich,” “Schindler’s List,” “Saving Private Ryan,” “Lincoln,” and many more that has arguably been underrated throughout his long and varied career. 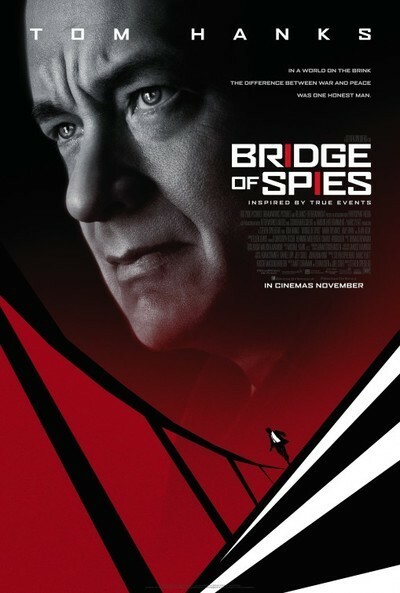 “Bridge of Spies” continues that tradition, in the best possible way.